For years Quetta in Pakistan has rarely been visited by foreign media organisations, as it is considered too dangerous. Now a World Service investigation has uncovered the reality of life for the city's persecuted Hazara Shia community in what some describe as "hell on earth". On 10 January 2013, a suicide bomber walked into a packed snooker hall in Quetta and detonated an explosive device, marking the beginning of what would become the bloodiest day in Pakistan's recent history. Eight people died in the initial blast and the area soon became flooded with people trying to help. A second bomb planted on an ambulance was then detonated. Listen to the full report on Assignment on the BBC World Service on Thursday May 2 and on BBC Radio 4's Crossing Continents on the same day at 11:00am. The attacks killed more than 120 people, most of them from the Hazara Shia community, in a campaign strategically planned to inflict maximum carnage. Quetta's Hazara community is on the front line of Pakistan's battle with violent extremism. Ruqsana Bibi lost three of her four sons on that day. The walls of her modest home are filled with family pictures. She sits on the floor holding three frames. Each contains a picture of one of the children she lost. "I ran to the mosque barefoot and I saw the bodies of my three sons. I kissed their faces. I carried them to the cemetery myself. The eldest was Khadim Husain. I said to him: 'You must take care of your brothers in the grave.' I don't know what happened to me then. People took me home." Mrs Bibi says her grandsons, aged nine and five, are afraid that they too will be "martyred" one day. "They say: 'Who are these people killing us?' Who are these people that are stirring up trouble between Sunnis and Shias? It didn't used to be like this." 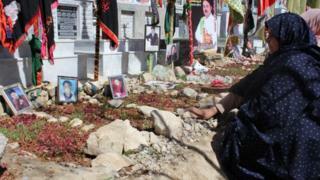 Mrs Bibi's family, like almost all of the victims of the Quetta attacks, are Hazara. Hazaras are ethnically Mongolian, with oriental features and light skin, different from much of Pakistan's population. The vast majority of Hazaras are Shia Muslim and are therefore declared "heretics" by militant Sunni Islamist groups like Lashkar-e-Jhangvi. Quetta is home to more than half a million Hazara Shias, making them an easy target for Sunni extremists who want to punish their "heresy" with violence. Five weeks after the attack on the snooker hall, another bomb was detonated in a crowded market place in Quetta, killing almost 90 people. It happened as people, mainly women, were shopping for groceries and schoolchildren were coming out of their classes. Lashkar-e-Jhangvi claimed responsibility for both attacks. The group released a statement declaring that they planned to turn Quetta into "a graveyard for Shias". The extreme violence in Quetta means many Hazaras feel pessimistic about their future in Pakistan. Nargis Ali, 19, was planning on going to Balochistan University, in Quetta. But faced with the security risks, her parents have asked her to give up on academia. "I got brilliant results but even the university staff say they cannot guarantee my safety. My parents really wanted me to study but they are just so scared of what will happen," she told the BBC. "Education is the most important thing to me - but what choice do we have?" Many young Hazaras have fled Quetta, in the hope of claiming asylum in Australia and Europe. It is estimated that 90% of those fleeing the violence do so illegally. Quetta is now home to a booming human trafficking industry. The journey to Australia via Christmas Island in the South Pacific is fraught with danger. Mohammed Changezi is a social worker, who runs workshops on migration at a Hazara community centre. His uncle, aunt and their children all drowned en route to Australia. "It's dangerous," he says. "Agents lie to get a few hundred dollars. There are so many people migrating because of the law and order situation." Mohammed Ibrahim, who is 28, is now back in Quetta after spending a year in an Indonesian detention centre. He paid a local agent to get him to Australia, and was put on a boat from Jakarta to Christmas Island. The boat began to leak and the captain deserted his passengers, leaving them to be picked up by the coastguard. "My brother also paid a trafficker to get him to Australia. We know that the boat sunk in December 2011 but my parents will not accept that he is dead. "Most families won't accept that their loved ones are gone. People say that there is a prison in the ocean and everyone will be released soon. Everyone keeps hoping that they will hear some news, but the news never comes. "The only reason we are leaving is for our survival. Our lives are threatened here - they have no value. What do you expect us to do?" Quetta is close to the Afghan border and is rife with Taliban activity. But the city is also being affected by an insurgency by Baloch rebels who are demanding complete autonomy and a greater share of resources from the mineral-rich region. The Pakistani government has faced widespread criticism for its inability to stop the violence. Paul Bhatti, the former minister in charge of "national harmony", blames Pakistan's long history of military dictatorship. "We have had many years of military rule and so the civilian government has not had enough time to make effective policy. We are doing our best but it will take time." Many believe the government is unwilling to tackle hard-line Sunni militant groups for fear of being deemed "un-Islamic". Arab influenced Salafi Islam, which takes a literal approach to the faith, is gaining ground in Pakistani politics. The nation's "Islamisation" is now one of the election's most contentious issues. Salafi-inspired groups such as Lashkar-e-Jhangvi and its sister organisation Sipah-e-Sahaba have terrorised Pakistan's Shia community for years. These groups have been banned by the Pakistani government but the organisation has re-branded itself as Ahle Sunnah Wal Jamaat. The party is now fielding candidates in general elections due this month on a specifically anti-Shia platform. Senior party member and National Assembly candidate Mohamed Fayyaz denies that the organisation is involved in attacks on Hazara Shias. "Just because someone said they are from Lashkar-e-Jhangvi, what proof is there that it was someone from our group? We don't want to murder Shias. We want them to be declared non-Muslim in the National Assembly. That is what we're working towards." Pakistan's forthcoming election inspires little hope among Quetta's Hazara community. Every day, Ruqsana Bibi visits the Quetta cemetery. After reciting a graveside prayer for her sons, she explained: "We don't know who these people are that are killing us and we don't know why the government won't stop them. "We just want them to remember that Hazaras are Pakistani too. We want someone to make this madness stop." Hear the full report on Assignment on the BBC World Service and on BBC Radio 4's Crossing Continents. You can listen via the Radio 4 website or via the Crossing Continents podcast.